Got up to the news that Sri Lanka had bettered England’s target with ease and the loss of only one wicket. England must now hope desperately that their games against the so called minnows are not disrupted by the weather. After walking Mix, Rachel, Mum and I went off to Church for Ann’s final service (technically she retired last night but today was her final service). Lots of her friends were in Church. I counted eighty nine-folk, normally we are just either side of thirty – there were lots of good-byes and Ann was quite emotional describing herself as theologically, from the liberal woman’s liberation wing of the Church. I’m not quite sure that I agree but I have greatly enjoyed sitting in the pews during her time as minister. 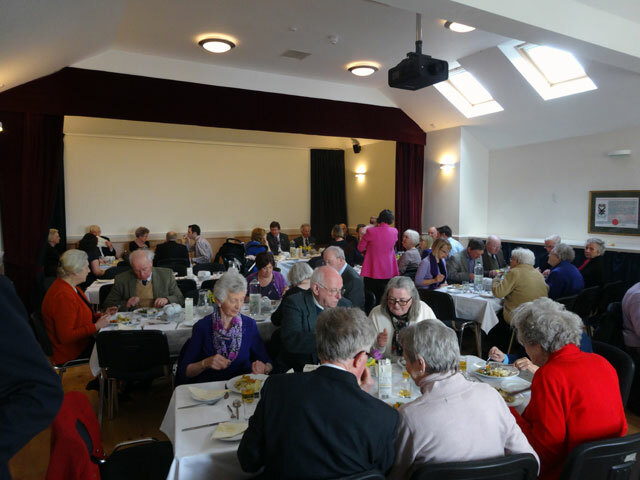 After the service and presentations, we all went down to the Village Hall for lunch – an excellent affair, Gavinton does good food. We ate well and we were in very good company. And then we came home. I got a bit done before it was time for Rachel and I to have a snack (Rachel had been to Evensong) and then we all watched Mr. Selfridge before bed. I had to be up early so I was glad to get to bed.